​ St. Johns residents looking for a restaurant that encompasses casual beach energy with high end cuisine should look no further than The Reef. Set against the backdrop of the Atlantic, with stunning vistas of the ocean in every direction, dining at the Reef gives one the feeling of being aboard a yacht, complete with a first class chef and live entertainment. Located as it is on the beach in a tourist town the concept is relaxed elegance. 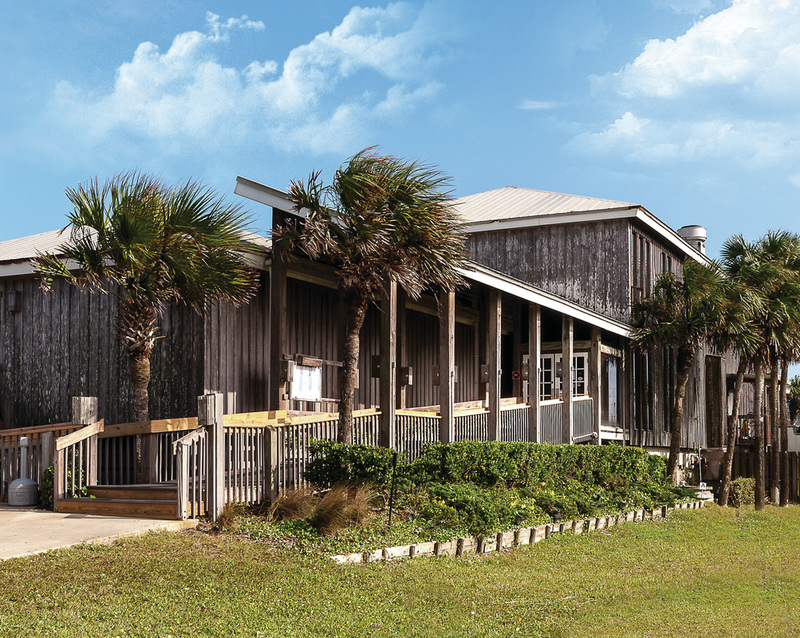 Outside, The Reef is a rustic-looking building with weathered boards and a North Florida feel. Inside, the scent of sea air mixes with diverse spices and fresh seafood while live music plays in the background every Friday and Saturday. It is a place where everyone and anyone is welcome, whether it is celebrating couples, families with children, casual groups or business people. People love the food, the daily happy hour, the music and the staff. Indeed, at the heart of what makes The Reef amazing is the well trained, courteous waiters, hostesses, bartenders and prep cooks who assist Executive Chef Bob Henle. Reservations: Available directly, through the website or by OpenTable. PAPPARE PRIMAVERA Choice of blackened Florida shrimp, herb-marinated chicken breast, or tofu served over a bed of zucchini pappardelle "noodles" simmered in a rich ginger and lemongrass coconut sauce with house creamed corn, carrot, sweet potato, and summer veggies. Topped with Mango-Pepper Slaw and fresh herbs. ​Imagine walking into a gorgeous, leafy green patio with a southern charm feel and tons of shade. That is what you will see at The Floridian. Inside the restaurant you will find local artwork depicting beach and local art themes with a boat hanging from the ceiling. There is a small, quaint bar located in the back of the establishment with few small tables. Inevitably, you will feel like you are on vacation. The menu boasts fresh, healthy local favorites. Datil BBQ, Not Your Mommas meatloaf, shrimp and sausage pilau, corn bread stack and shrimp and grits (of course). There’s also healthy fare including a delightful Pork Belly Caprese salad with heirloom tomatoes and a delicious southern Belle salad loaded with your choice of meat and peaches, sweet potatoes and candied pecans. They also offer tempeh or tofu as vegetarian options and substitutes. This writer highly recommends the cheese board as an appetizer. It is loaded with cheeses from Sweet Grass Dairy from Thomasville, GA, local FL honey, pecans, apples, peaches and a French baguette. There are daily desserts including seasonal cupcakes, key lime cheesecake and a chocolate coconut pecan bar (is your mouth watering?). They offer several local wines and beer. They have several (7) aperitif/digestive aromatic wine drinks, which include a Madeira Cobbler with ingredients of a fortified wine, seasonal fruits, citrus/vanilla simple syrup and nutmeg (yum). They offer a moderately priced kids menu with staple entrees including quesadilla, chicken, shrimp and ribs. By the way, several menu items can be made gluten free! The Floridian has a reputation of being a fine establishment and appears popular with the locals and tourists alike. They find the finest local, fresh ingredients from local farmers, seafood vendors and ranchers and this is quite evident in their food. The Floridian is a part of the sustainable food movement, which is quite commendable. It embodies “clean eating” at its best! The atmosphere is nice enough for a Saturday Date night dinner wearing a cute sundress or laid back enough for stopping by on the way back from the beach wearing shorts and a tank. The next time your near 39 Cordova St. in old St. Augustine, stop on in and enjoy a local meal and drink! Looking for a taste of Maryland seafood in your own backyard? Well, look no further than Blue Crab Crabhouse. 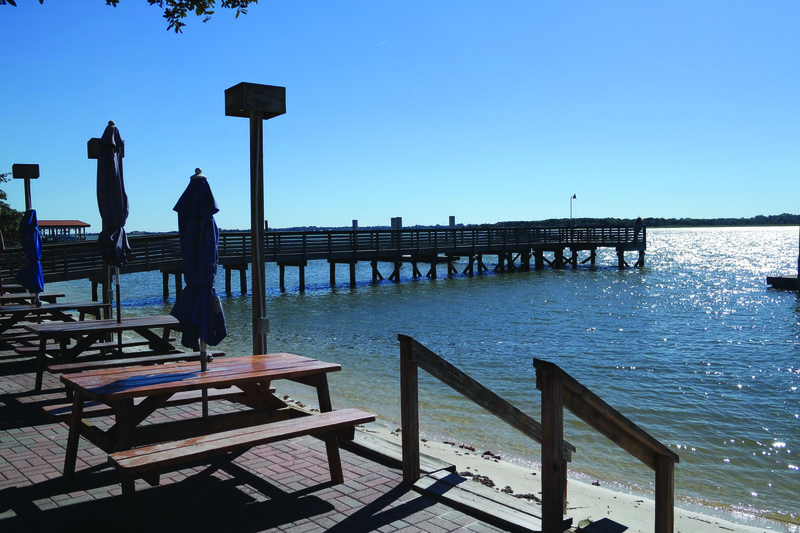 Nestled among the trees of Mandarin and right before the Julington Creek Bridge, you will find a Chesapeake Bay style crab house. Relax either on the casual outdoor deck or come inside and enjoy the rustic, cozy atmosphere. All of the tables are covered in brown craft paper, so the kiddos, along with the big kids can enjoy doodling while you wait for your food. You can also leave a message, or just your name on one of the restaurant walls. For starters, we ordered the Sausage and Shrimp Gumbo and the Peel and Eat Shrimp. Both were outstanding, and the Gumbo had just enough kick to be delicious. Perfect if you are looking for something light. They have a full bar, with selections to compliment any food choice. There are so many choices, we found it hard to choose, but ended ordering Fried Shrimp and the Fish Dinner. Both came with two sides and some very yummy hushpuppies. The fish was fresh, and the shrimp was fried to perfection. Although, we didn’t have a crab dish, we saw lots of people who did. The lowest priced entrée is $10.00, unless you make it for early bird dining, and the highest priced entrée is the King Crab Legs at $36.00. There are many delicious seafood selections, but for the non-seafood diner, there are a two chicken options, a vegetarian selection, along with a meatloaf. There is a kid’s menu available, weekday specials, and early bird dining during the week before 6 pm. On Sundays, you can enjoy a little live music outside on the covered deck. So, if you want a little taste of Maryland, head on over to the Blue Crab Crabhouse. From pint to pudding (Sticky Toffee Pudding, that is! ), King’s Head British Pub will have you wondering why it’s taken you so long to find this hidden gem. Immediately as you step through the doors, you are embraced by the old world charm, amazing smells, and warm “welcome”. Sticky Toffee Pudding! Need I say more? Oh yes, with custard! BEST! THING! EVER! Warm, gooey, and definately something I will be going back for! Following dinner, we enjoyed a few games of darts and even challenged a couple friendly blokes to a game. 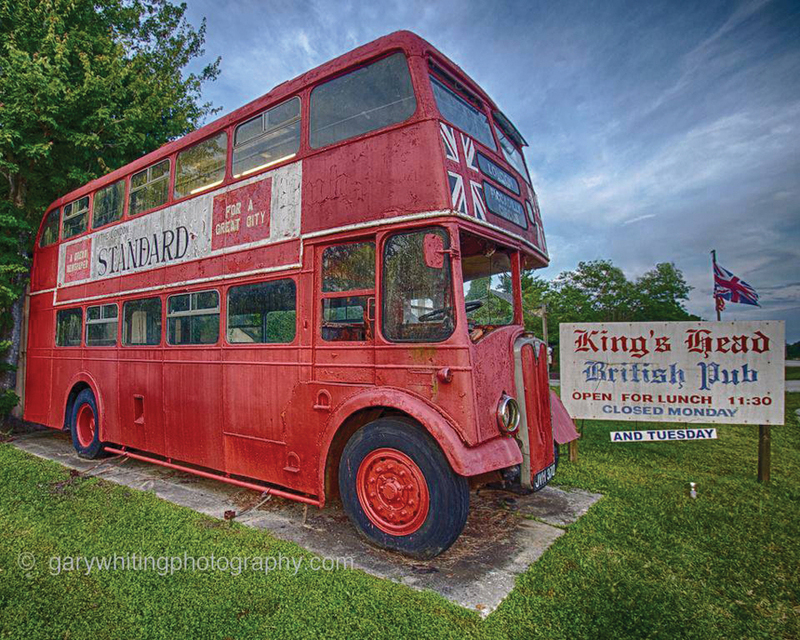 If you want to feel like you’re “on holiday” for an evening, leave your passport at home and head on over to Kings Head Pub. We’ll meet you there! www.blackbluegrill.com (705 Hortons Trace (International Golf Parkway), St. Augustine, FL 32095) 904-904-5500 Black & Blue Grill is a neighborhood restaurant featuring the finest in local fare. Our steaks and seafood are selected for their freshness from local Florida beef and seafood purveyors. Our pasta dishes are made from recipes handed down from the owners’ family who came to America over 90 years ago from Italy. Our Executive Chef, Matthew Ingrao, an owner, is Le Cordon Bleu designated graduate from the Pennsylvania Culinary Institute. Enjoy our signature creations including our B&B Crab Cakes, Bacon and Bleu Burger, Lobster Mac & Cheese or our popular Shrimp and Grits. Matthew even makes his own ice creams and continuously surprises guests with assorted homemade crème brulee (salted caramel is a favorite). If you are a fan of Italian, you will enjoy the homemade Lasagna, a 9 layer family favorite and offered as a weekly special.Sundays are special with B&B hosting a lively Tail Gate Party with the DirectTV SUNDAY TICKET. The football fun continues every Monday Night and Thursday Night with NFL games and Saturdays, all day, with college games. Enjoy your meal in our unique “industrial” deco dining room or on the deck overlooking our lake and the stunning Florida scenery. Come experience an affordable and enjoyable time! How did you first become interested in cooking and how did it lead you here? My interest in cooking started when I was very young watching The Food Network, shows like Yan Can Cook, and The Essence of Emeril. My Grandmother was also an inspiration to cook. Going to her house on Sundays for dinner, eating the best food, thinking she was the most amazing cook. I’m still trying to duplicate her recipes. My first cooking job was in my home town of Jamestown NY (about 2hrs south of Buffalo) at a little pizza place that only did delivery. From there I went to a casual dining restaurant as a dish washer and worked my way up to a prep chef within 6 months. That ignited my love for food as a teenager. From that point on, I knew I wanted to be in the restaurant industry and own my own place. That’s when I scoped out PCI. What are your hopes and dreams for Black & Blue? My hopes and dreams for Black and Blue…….hmmm….well, basically I’m living my dream of owning a restaurant. My dream for the restaurant is that it is successful, that we become a name in the community, and that someday I can pass it to my two daughters, Maddie (5), Mollie (5 months), just like my father will pass it on to me. Why is Black & Blue Grill unique? What sets us apart from other restaurants is that we do mostly scratch cooking. Going back to the way restaurants did things a long time ago. We don’t use pre-made dressings, marinades, soups, sauces, it all gets made in-house. When it comes to our meats, we source it Florida-Local. It comes from the Seminole Indian Tribe. (This florida grass fed beef which is the highest grade produced in Florida) We also cut those by hand in house. Kinda old-school with a modern twist. I love taking old time dishes and putting a modern twist on them. I love the challenge of something that has been around for years and re-inventing it. My specialty – I don’t like thinking I have a “specialty”. To me, when someone calls it a “specialty” that makes it almost seem like it is the one and only thing that you do extremely well. I strive for perfection on anything that I’m cooking. But, if I had to pick a cooking style or ethnicity I like the best, it’s a toss-up between Italian and Asian. Coming from a mostly Italian family, it’s what I grew up with. The Asian, I’ve always loved loved loved, Asian food. www.belliniitaliana.com (105 Nature Walk Pkwy, Suite 101, St. Augustine, FL 32092 / 495-7276) Since the owner is really from Sicily, Italy, Bellini’s makes good on its promise of specializing in authentic Italian cuisine. They highly recommend the Bellini Polenta Ragu for starters, with Bellini Provencal and New Zealand Lamb Chops as main courses. You’ll want to share our House Tiramisu recipe which features rum and coffee-soaked ladyfingers layered with mascarpone custard and whipped cream. Enjoy your dinner! Bellini’s offers a delicious Italian menu with recipes direct from Sicily. Owners Benny & George are brothers who moved to the United States 30 years ago. They learned the restaurant business by working in Italian restaurants, first in Connecticut, then moving to Florida in 2001. They have established many restaurants since then, including the award-winning Vito’s, 2-time winner of Best of Jax. Benny and his wife Tanya (who is Sicilian) traveled throughout Italy this past summer gathering recipes prior to opening Bellini’s. Their goal was to create dishes that are popular like lasagna but also introduce unique Italian fare. The secret is that everything is freshly made. Try the gnocci with pesto cream sauce, chicken dinner with artichoke, lemon and pasta, or anything with Pancetta, (Italian bacon). For dessert, the homemade Tiramisu is not easily replicated! All the wines are imported from Italy. For a fantastic dining experience you cannot go wrong with Bellini’s, located on CR 210 West in St. John. Continuing over 100 years of serving the finest in local seafood, Aunt Kate’s pleasures both the eye and the pallet. Sited in a grove of live oaks on the bank of the Tolomoto River, you can dine on the outside decks under the trees or inside in either the main dining room or the Victory bar. The trees, scarred by fire, still lean over the water, framing the ever-changing sunset. Wading birds feed along the shoreline while pelicans beg from fishermen on the docks. Occasionally, a manatee or dolphin will swim along the shoreline while passing boats cruise the channel. We offer outstanding family dining, whether you’re looking for steamed oysters, peel ‘n eat shrimp, fresh salad, great soups, a terrific steak or pastas, we have something for everyone and every appetite. So come, tie up at our floating dock, walk from North Beach Camp Resort right next door, or come by car; you’ll always be welcome! Aunt Kate’s is our family’s go-to place. Did I mention I have four kids and not only do we need wholesome old-fashioned fare that is appealing to all age levels, we need wide open space and someplace to explore after our meal. Aunt Kate’s seems to have it all. 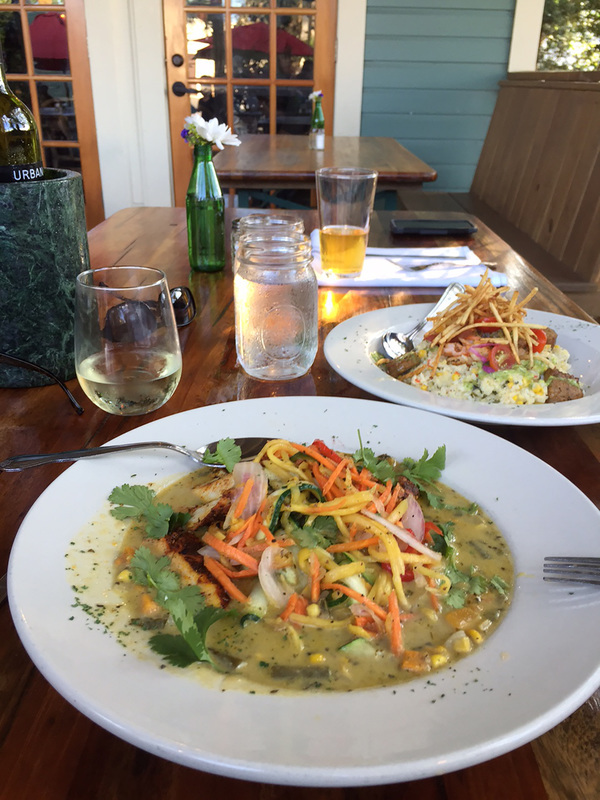 There’s the view of the sunset over Tolomato River, a dock, fresh fish in the fish house, datil pepper chowder and the sweetest chef in town, Chef Jake Hollander. Chef Jake Hollender has a manner as unpretentious as the restaurant where he creates his old Floridian style culinary delights. Cornmeal crusted fresh caught flounder, mouthwatering local oysters and collard greens are a few of the items found on the menu. Many of the menu items, including the cornbread and clam chowder, use locally sourced datil peppers. They even serve pilau (perlo), a Minorcan rice dish that anyone who grew up in these parts is sure to remember as a kid. If you are feeling more adventurous, gator is on the menu too. The day I visited Jake at Aunt Kate’s he was in the middle of a fish project. They just had 200 pounds of fresh flounder delivered and they were in the fish house out back descaling and filleting. Chef Hollender got his start at local restaurants in St. Augustine where he worked his way up from dishwasher and bus boy to sous chef to his current position as Executive Chef at Aunt Kate’s. www.thereefstaugustine.com ( 4100 Coastal Highway, St. Augustine / 824-8008) There are few remaining true oceanfront restaurants in Northeast Florida, and of those The Reef, reopened in 2002 under the direct ownership of the Usinas, commands the most spectacular views. Sit at any table inside and the view is dynamic to say the least, or enjoy the recently rebuilt and expanded deck where you not only look out at the ocean, you listen to it too as the waves break and the birds sing. To complement this vista Chef Bob Henle has created a menu primarily of fish and seafood balanced with beef, poultry pasta and creative specials, always fresh and locally sourced whenever possible. The Reef is famous in the St. Augustine area. If you have ever had the pleasure of eating there it is no surprise why it shines. As one of the only ocean-front restaurants in St. Augustine, it sits less than one hundred feet from high tide with views and sea breezes from every table, and has some of the best food around, created by Executive Chef Bob Henle. I was lucky enough to sit down with Chef Henle recently to learn about the food he creates at the Reef. Our conversation began with food, Saffron Mussels to be exact, a dish he developed a while back which has evolved over time. It features a datil-pepper, Spanish inspired saffron, cream sauce with layers of delicious flavors; drizzled over a bed of meaty mussels with enough crostini to dip in the leftover sauce. Wow! I wondered how he comes up with these amazing ideas for food and why they taste so good? Bob Henle has not always been a chef. Before he was a chef he was a mechanic in the Air Force and lived in the southern part of Spain near Rota for fifteen years. After retirement he decided to shift gears and become a chef. His interest in cooking began when he was a kid. His parents went on a special diet that was extremely bland and Bob says he had to learn how to cook or he wouldn’t want to eat. He found he liked it but at the time had not thought of it as a career. All those years living in Spain was an inspiration to him, and he continued to try different recipes and was able to learn about food as he traveled throughout Europe. After leaving the Air Force, Bob’s formal education in the culinary arts began at First Coast Technical College. While at FCTC he thrived, participating in demonstrations, and winning a prestigious national contest that landed him a trip to Barcelona, Spain and attendance at a culinary school there. Bob says the experience was amazing and allowed him to hone his skills. His style as a Chef is influenced by the time he spent in Spain and his travels. He also keeps it simple, using fresh local spices, fish and vegetables. He loves to create new dishes for the Reef. He begins by putting a few things together from ideas he gets reading magazines or watching cooking shows, and makes his own combinations. He says he usually changes the menu every six months, which keeps it interesting. Some items in the works on the new appetizer menu; an Italian inspired Chicken Liver Pate, and fried manchego cheese. Mmm..... Sounds delicious. 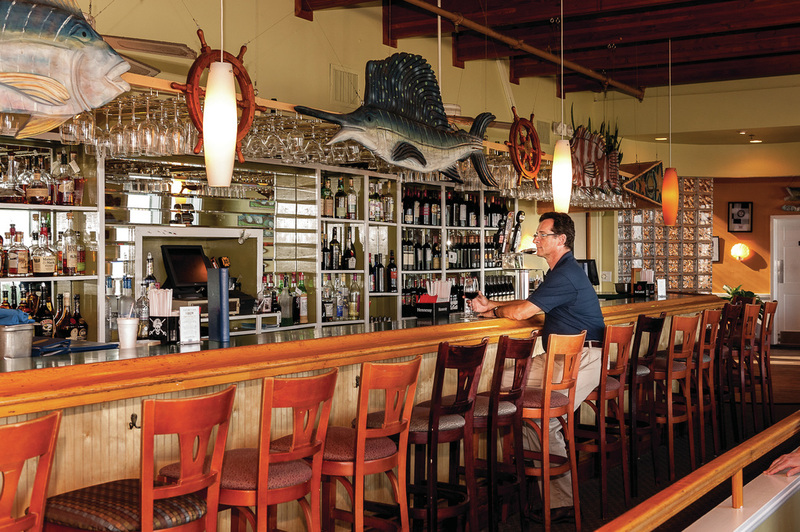 The Reef is owned by the Usinas, one of St. Augustine’s historic families and has been a restaurant since 1989. It was formerly called Comptons but opened as Mulvey’s Reef in 1999 and was later changed to The Reef. Chef Henle created a menu primarily of fish and seafood balanced with beef, poultry pasta and creative specials, always fresh and sourced locally whenever possible. The menu at the Reef is about to change again and will include a slew of appetizers or small bites. Whether it’s the for the specialty dishes created by Chef Henle, the award-winning Sunday Brunch, or simply to enjoy the view on the ocean deck, or from inside, The Reef is the incredible! www.staugustinesumo.com/ (107 Nature Walk Parkway, Suite 109, County Road 210 West, St. Johns / 230-1999). www.staugustinesumo.com/ (107 Nature Walk Parkway, Suite 109, County Road 210 West, St. Johns / 230-1999). 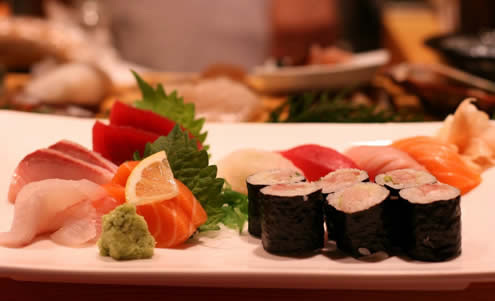 Sumo Sushi is one of the best Japanese Steak House & Sushi restaurants in town! Conveniently located on CR 210 next to Every Body Fitness, come and enjoy delicious Sushi & traditional Hibachi Grille in an amazing Japanese steakhouse. Sit back and have their Tap pan yaki Chefs prepare your meal right in front of you. Bring your family and friends and relax in a modern, yet comfortable atmosphere. Daily football games on large screen televisions visible from any seat in the house make it an ideal place to hang out with friends. The food, service and environment are guaranteed to satisfy. Somtimes you are just in the mood for something fun. Sumo Sushi offers a unique dining experience located on CR 210 West. It has an extensive menu that includes a complete hibachi grill with selections of beef, shrimp & chicken cooked in front of you by skilled tap-an-yaki chefs. Or, if you would like sushi Chef Jun-Hee at the Sushi Bar will delight your tastebuds with fresh fish presented with Japanese style and beauty. www.losportalesmexicangrill.com (2245 CR 210 West, Suite 109 / 819-1486) Mexican food is comfort food and one of our favorite local places is Los Portales Mexican Grill. Think delicious flavors and laid back friendly atmosphere with a team of Chefs who know how to whip up classic dishes like enchilladas, savory rice, fijitas, or freshly made guacomole. The owner, Jesus is originally from Guadalajara so any dish referencing that locale is sure to be amazing. Los Portales Mexican Grill proudly offer a huge selection of Mexican dishes, included our famous fajitas, enchiladas, Mexican style tacos and the biggest vegeterian menu in the whole city. Our bar serves a good selection of Tequilas along with domestic and imported beer. The fact that our restaurant is fun and festive is a reflection of the family's philosophy and ideals, and our own casual ‘Jalisco’ lifestyle. Tropical Smoothie Café’s menu boasts bold, flavorful food and smoothies with a healthy appeal. Our food and smoothies are made to order with fresh ingredients. Our smoothies are made from superior simple ingredients including real fruit and natural sugar. Our toasted wraps, sandwiches, flatbreads and gourmet salads are made fresh with high quality meats and cheeses and topped with fresh produce and flavorful sauces. Combine that with a fun atmosphere and friendly hospitality and you can see why people return again and again for the Tropical Smoothie Café experience! 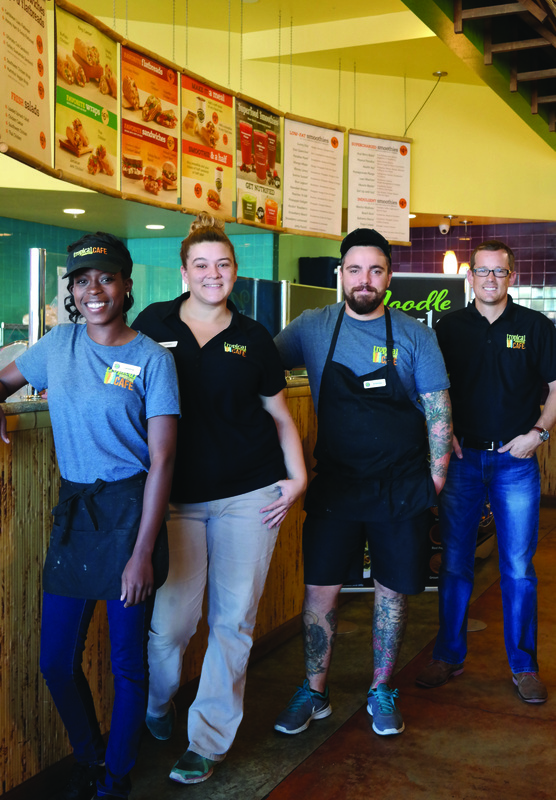 The Team at Tropical Smoothie Cafe on CR210 West; including Owner Nick Crouch (right), Lanisha, Stephen & Lindsay. One of the best aspects of Tropical Smoothie Café is that they are always introducing new delicious items! Experience a fresh take on the turkey club with the introduction of the Savory Island Club sandwiches, including the Chipotle Cranberry Turkey Club or the Rustic Turkey & Apple Club. The Naughty or Nice Smoothies offer a variety of options to satisfy seasonal cravings, with both light and indulgent options featuring cranberry and pumpkin . The Very Berry Cranberry Smoothie, made with strawberries and cranberries, or the Peaches ‘N Pumpkin Spice Smoothie, made with pumpkin puree, peaches, goji berries, cinnamon and non-fat yogurt. The Cranberry Truffle Smoothie, made with strawberries and cranberries, or a Pumpkin Pie Smoothie, made with pumpkin puree and cinnamon, both of which are made with non-fat yogurt and blended with Ghirardelli White Frappe for a delicious treat. “This time of year people are looking to enjoy their favorite seasonal flavors,” said Nick Crouch owner of several Tropical Smoothie Cafés in North Florida. “The Naughty or Nice Smoothie line-up provides them with the ability to select a smoothie that best fits their individual lifestyle needs. For more information about Tropical Smoothie Café in North Florida including catering opportunities and gift cards, please visit www.tropicalsmoothie.com. www.yummyasianbistro.com (2254 Country Road 210 W, Suite 117 / 808-1988) This fusion restaurant serves freshly prepared dishes with an enormous array of options. Come and experience the traditional Asian cuisine representing Chinese, Japanese and Thai Food. The environment is casual and inviting with a stylish Asian fusion design. Dine in and enjoy a friendly atmosphere with great service that make you feel welcome. They guarantee that the prices are right, and the chef’s specialties are downright... ‘yummy’! www.mezcalcantinamexicangrill.com (Julington - 111 Bartram Park Oaks Walk / 342-5968; Ponte Vedra - 880 A1A North Suite 18B / 373-0492) With two locations, one in St. Johns and one in Ponte Vedra, Cantina Mezcal offers authentic Mexican food in a festive environment. Brightly colored hand painted murals on the walls and a friendly staff enhance one’s dining experience. They suggest trying the succulent enchiladas - which are the best. No doubt, the fresh and delicious ingredients will bring you closer to Mexico.